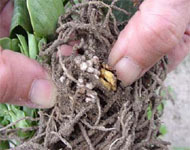 Biological nitrogen fixation, where rhizobia in legume root nodules convert atmospheric di-nitrogen into ammonia for plant growth is one of the great success stories in applied soil biology. In an era of rising costs, the role of rhizobia to "fix" biological nitrogen within legume root nodules is more important than ever. The replacement of nitrogen fertilizer with biologically-fixed nitrogen is estimated to save Australian agriculture approximately $4bn per year. Legumes provide an economically and environmentally sustainable source of nitrogen and usually soil nitrogen increases where they are grown. For over 55 years, the AIRG (and its predecessors) now located at the Central Coast Primary Industries Centre, Ourimbah have controlled and maintained the quality of legume inoculants through collaboration with industry and R & D bodies. National Code of Practice and Quality Trademark (PDF, 234.95 KB) for Legume Microbial Inoculant Products used in Australian Crops and Pastures. Why are Australian inoculants the best? Inoculating legumes is cheap, costing less than $5/ha, yet can result in an extra $200-300 worth of N in the crop or pasture. For example, inoculation of soybean on the Liverpool Plains, NSW increased nodulation from almost zero to 100%. Grain yields were increased by approximately 1.5 t/ha, worth today $900/ha, dwarfing the $5/ha cost of inoculation. The cost of legume nodulation failure because seed was not inoculated correctly or because of low quality and faulty inoculants is substantial. Australian farmers inoculate about 2.5 million ha or 50% of the legumes sown annually. Essentially all of the estimated 2.7 million tonnes of nitrogen fixed annually by legumes growing on about 22.5 million ha of land can be attributed to either current or past inoculation, valued at $4bn. Inoculation has played a key role in the success of legumes in this country and AIRG and its predecessors, ALIRU, AIRCS and U- DALS have ensured that Australian farmers and producers have always had access to inoculants of the highest quality. What if the market was suddenly flooded with low quality inoculants either produced locally or imported from overseas? The simple answer is that such a development would put at risk the production of grains such as lupin, chickpea, faba bean, pastures and livestock, and would cost the individual farmer or producer money. The cost of a nodulation failure of 100 hectares of soybean could exceed $60,000. Clearly, the continuing and uninterrupted use of high quality legume inoculants has a very large economic benefit to Australian farmers. The use of AIRG quality assessed and approved inoculants is strongly recommended. For general enquiries please email airg@dpi.nsw.gov.au.